Salt and Pepper Shrimp Edamame Salad - What the Forks for Dinner? Some days you eat salads and workout ……Other days you eat cupcakes and refuse to put on pants……it’s called balance…..lol. Funny quotes get me every time, especially when there is truth behind them! Eating healthy….the struggle is real. Real hard as you get older. As I approach the big 60 I find staying in shape extremely difficult. Although I have yo-yoed since my early twenties, I have always found it easy to lose weight. Eat a little less, walk, pilates or yoga a little more. Ah yeah ….well that’s not working so much…grrrr!!! In previous posts I have mentioned that I am now a point counting Weight Watcher and I’m doing ok. But it’s really hard when 1. you write a food blog, and 2. hmmm you write a food blog. 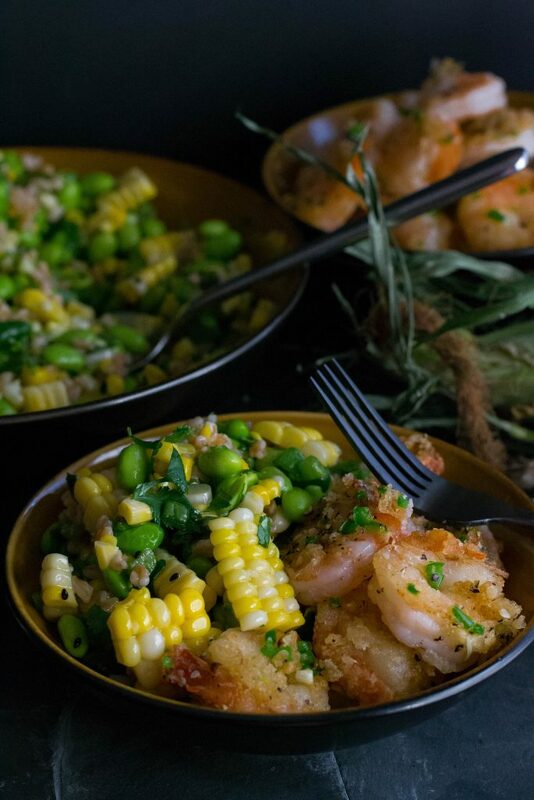 So, while Salt and Pepper Shrimp Edamame Salad is a bit high for points, it does have many healthy ingredients. Edamame is a young soy bean that is harvested early. You can buy them shelled or in the pod (don’t eat the pod), fresh or frozen. Honestly, I have only purchased them frozen, cause they are already, ready! Gluten free, low in calories, no cholesterol, and an excellent source of a complete protein. Edamame is also loaded with vitamins and minerals. Downside…..people who are allergic to soy products might not be able to eat them. Farro was a discovery I made a while back and I love it. High in fiber, a good source of protein, and high in B and other vitamins and minerals. While farro does contain gluten, if prepared properly, the gluten is pre-digested and broken down, which makes it easier to digest. To read more about farro click here Dr. Axe has a great article on the benefits. 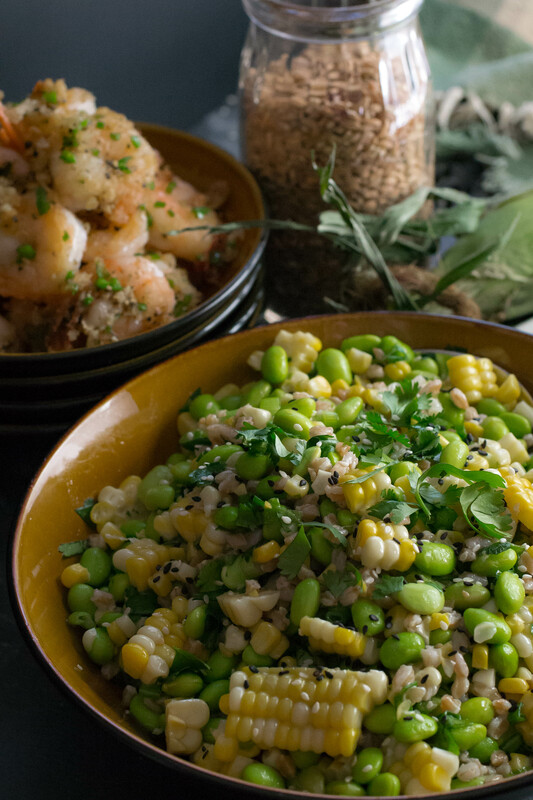 Corn and cilantro are a natural paring……if you like cilantro. Cilantro has a pungent citrusy flavor that sadly some folks do not like….I know crazy huh! Well apparently there may be a genetic reason why. A specific gene can make some people sensitive to a compound in cilantro that makes it taste like soap……I do not have that gene…whew!! For this recipe if cilantro is not your thing you can substitute parsley. I thought I had had shrimp cooked every way possible….wrong! Salt & Pepper Shrimp is a Chinese style fried shrimp ( I cut back on the oil….a lot!!) made with just a few simple ingredients… and it cooks in a flash. 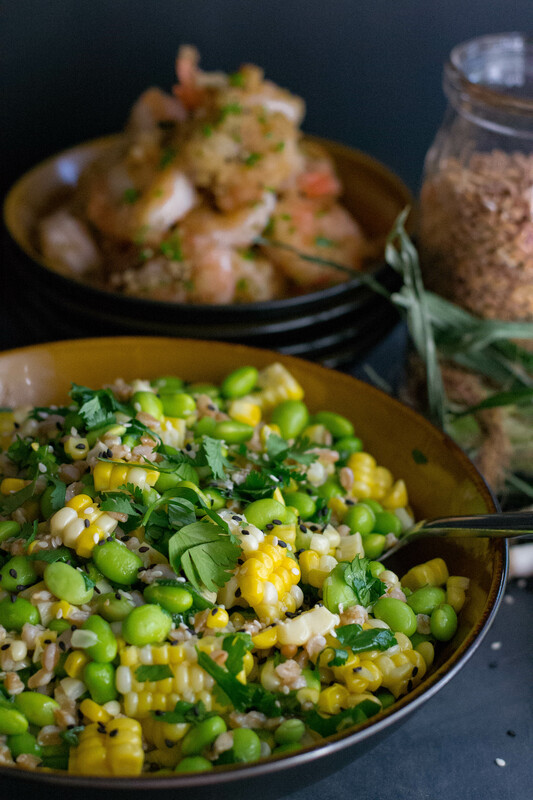 Perfect compliment to the refreshing salad of edamame, corn, and farro. A light simple sesame flavored dressing and you have a delightful, quick, easy, and healthy salad. 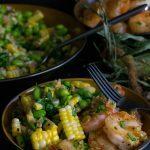 Perfect for a quick weeknight dinner or a perfect side for weekend grilling. Are you in the mood for a salad and the gym? Or a cupcake and no pants? Choose the salad! 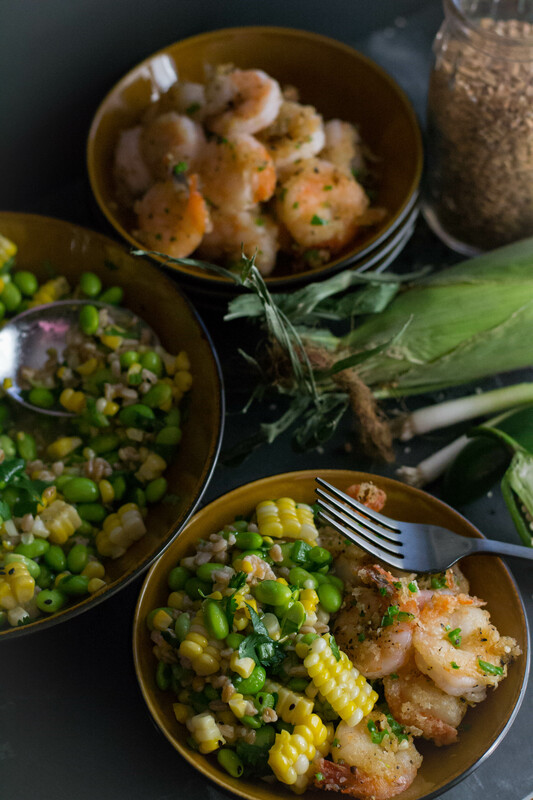 Salt and Pepper Shrimp Edamame Salad. 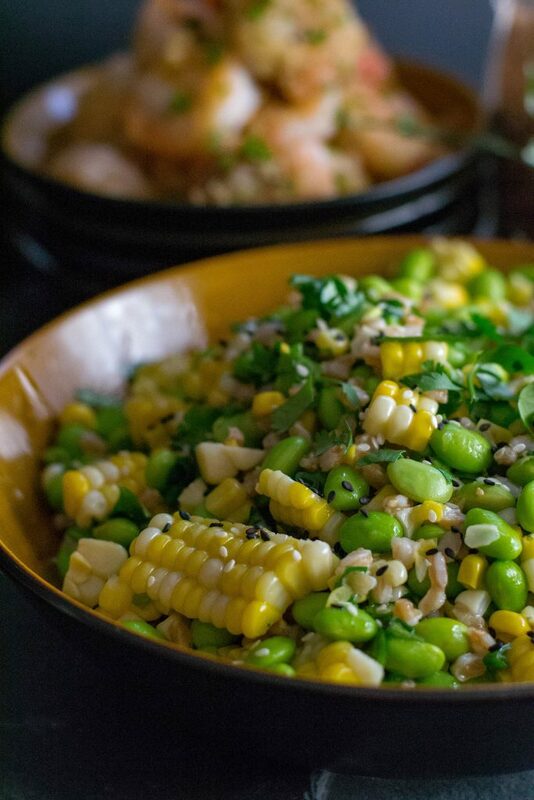 In a large bowl place edamame, *corn, green onions, cilantro, and *farro. Set aside. In a small bowl whisk together all dressing ingredients until emulsified. Set aside. Pat shrimp dry and place in a large ziplock bag. Sprinkle cornstarch in the bag with shrimp and shake to coat shrimp evenly with cornstarch. Heat 2 tables spoons avocado oil in large skillet or wok until very hot. Add shrimp and cook for 2-3 minutes until shrimp is opaque. Add garlic, jalapeño, salt and pepper and toss until shrimp is coated. Remove to a serving dish. Beside to spoon any remains spice from the pan over the shrimp. Pour dressing over salad and mix until all ingredient are coated with dressing. Let salad set for 30 minutes before serving for flavor to marry. Serve salad in individual bowls and top with shrimp. Corn – I cook corn on the cob in the microwave with the husk still on. Easy and the silk removes cleanly after cooked this way. Corn can also be cooked in the oven 350* for 30 minutes. * Farro can be cooked on top of the stove or I cook mine in my Instant Pot. Be sure to follow directions as different brands may require different cooking times.